Learn how to save money and get creative during the holiday season. Make gifts, DIY decorations, and so much more. Is your head swimming with exciting Christmas craft ideas? You're not the only one! It's never too early (or too late) to start working on home decor, DIY gifts, and handmade decorations. The projects in 7 Thrifty Christmas Craft Ideas are suitable for adults and children, so you can get the whole family involved in the creative side of Christmas this year. Whether you prefer to work alone or to spend time with the kids, this eBook has a project in store for you. Homemade Christmas gifts and decorations don't need to be complicated, time-consuming, or expensive. Check out this eBook to see how simple and fun crafting for the holidays can be! From homemade Christmas gift ideas to kids' Christmas crafts, you'll find fun and unique ways to celebrate the holiday season. Best of all, you won't have to spend an arm and a leg to make it a memorable Christmas. All of the DIY Christmas crafts featured in 7 Thrifty Christmas Craft Ideas can be made from easy-to-find, inexpensive supplies. Some of the projects only require you to dig into your recycle bin. No matter where you find the cheap supplies, you can rest assured the finished product will look amazing and light up your space with cheer and joy. Download your free copy of 7 Thrifty Christmas Craft Ideas today! Don't Miss Our Other Christmas Craft Ideas! How Do You Save Money During the Holiday Season? Times are tough. We scrape and save throughout the year, yet the Christmas season still leads to stress and financial strain. Not to worry! 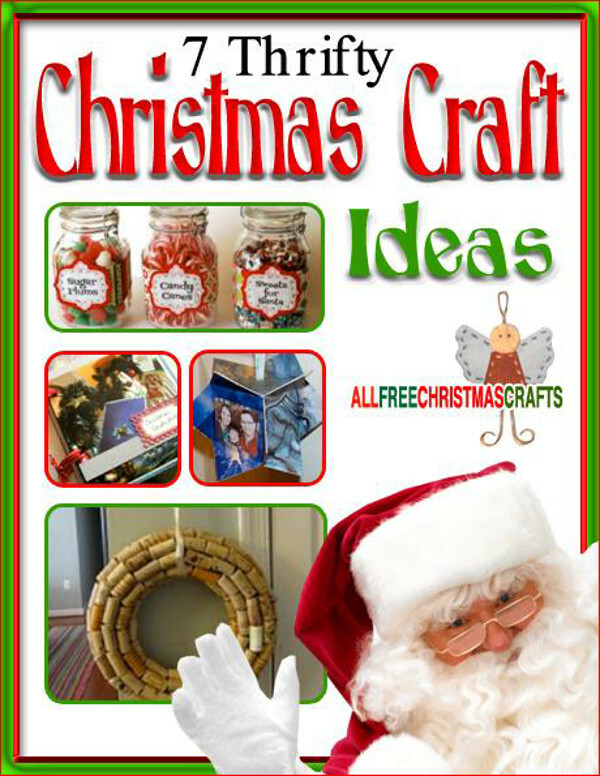 This free eBook is filled with inexpensive homemade Christmas gifts, ornaments, wreaths, and more. Use felt, cork, paper, and other materials to construct DIY Christmas crafts that will last for years. Enjoy friends and family this holiday season – with the easy Christmas crafts in this eBook, there’s no need to worry about anything else! Check out each of these great Christmas craft ideas from some of our favorite bloggers. Each of these easy Christmas crafts is unique and fun. It doesn’t matter what time of year you feel the Christmas spirit, either. Whether it’s Christmas in March, July, or December, there’s always a reason get into the holiday spirit. You can find more tutorials, tips, and crafts at AllFreeChristmasCrafts.com. Our eBooks, like all our DIY Christmas crafts, are absolutely FREE to members of our crafting community. Please feel free to share with family and friends and ask them to sign up at our website for our free e-mail newsletter. Download your copy of 7 Thrifty Christmas Craft Ideas today! Christmas Card Saver (pg. 7) - Every Christmas, you receive tons of heartfelt cards in the mail. By the time New Year's Eve rolls around, you might wonder what to do with all of those thoughtful messages. Discover a new way to store cards so you never have to give them away. This little book is one of our favorite Christmas craft ideas because it combines the crafty and clever with the sentimental. Christmas Candy Jar Label (pg. 11) - This is perfect for inexpensive last-minute homemade Christmas gifts. Give these DIY Christmas crafts to teachers, neighbors, and acquaintances. When making these labels, use freezer paper and felt. This is a great DIY Christmas craft for children, too. Junior crafters will have a blast filling the jars with treats like candy canes, gumdrops, and chocolates. Homemade Photo Ornament from Christmas Cards (pg. 16) - If you like to make homemade Christmas ornaments, then you'll adore this fun project. You can make a new version of this ornament craft every year using the new cards you receive. Stay in the Christmas spirit even after the holidays come to a close by making Christmas ornament crafts from your favorite Christmas cards. If you had to choose one easy Christmas craft idea to make this year, this project is the way to go. Wine Cork Wreath (pg.19) - This is one of the most fun homemade Christmas wreath ideas. Save your wine corks throughout the year and you'll have all the materials you need to make this project. Rustic, natural-looking easy Christmas crafts create a down-home ambiance. DIY Christmas crafts for adults have never been this much fun! This rustically charming wreath is so easy to make. Free Craft Video: eBook Sneak Peek! You can easily download and print out each book for on-hand reference while crafting. Three weekly emails with free crochet patterns, tips, collection pages and more. New FREE projects made available to you throughout the year. Access to our free library full of 1000’s more free projects and tutorials. The opportunity to share ideas and help others in the Christmas crafting community. If you want to save money without sacrificing quality this season, download 7 Thrifty Christmas Craft Ideas now; it’s free! Be sure you subscribe to receive our newsletter Crafty Christmas Ideas, too. Once you sign up, all of our easy Christmas gift ideas, Christmas crafts for kids, Christmas craft ideas, and more will come to your inbox weekly. Tell Us: How Do You Save Money During The Holiday Season? I love every ebook I have gotten from this site. I download them on to my iPad and then pick out the ones I want to keep. It saves on paper and ink. This ebook is going to be put into immediate use. It's not to early to get ready fir Christmas. I now have some great ideas for Christmas , thanks! Many years ago I had pattern for a Santa boot made with a gallon milk jug and red and white felt. Sadly to say, over the years, I lost it. If anyone has this pattern I would greatly appreciate it. I put a plant in them and they look so decorative. Ecellent! A lovely website that has useful and charming ideas. Thanks for sharing this with us.